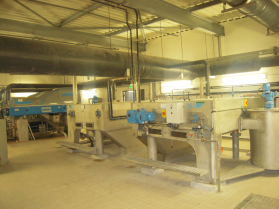 dewatering using a belt filter, a centrifuge or a filter press (see liquid sludge treatment). In both cases, the choice of flocculent is extremely important as it governs the filtration capacity and the sediment dry solids content. a series of flocculent samples prepared with a 1 g· L-1 concentration for powder polyelectrolytes and a 2 mL· L-1 concentration for emulsion polyelectrolytes. This is the preferred test used to determine the best flocculent applied for filtration (drainage – belt filter – filter press). 1 regulated vacuum pump capable of creating a 0.5 bar vacuum. for the purpose of the Büchner, measurement select the beakers where sludge flocculation required the lowest flocculent dose. stop the stopwatch after 150 mL of filtrate has been collected, i.e. «t» seconds. The polyelectrolytes that should be selected for industrial trials are those that produced the shortest time “t” (fastest to drain) for which the interstitial water is the least viscous. A 500 mL sample of sludge is required for each test. isolate the beakers containing the least amount of solids (series 2). The most suitable flocculants are those from series 2. The most suitable flocculants will be those in series 2.
flocculated and drained sludge adhesion to the screen (fouling capability). lowest screen fouling over time. d) sludge cake separates easily on delivery: cake has a “scaly” appearance and does not adhere much to the belts.